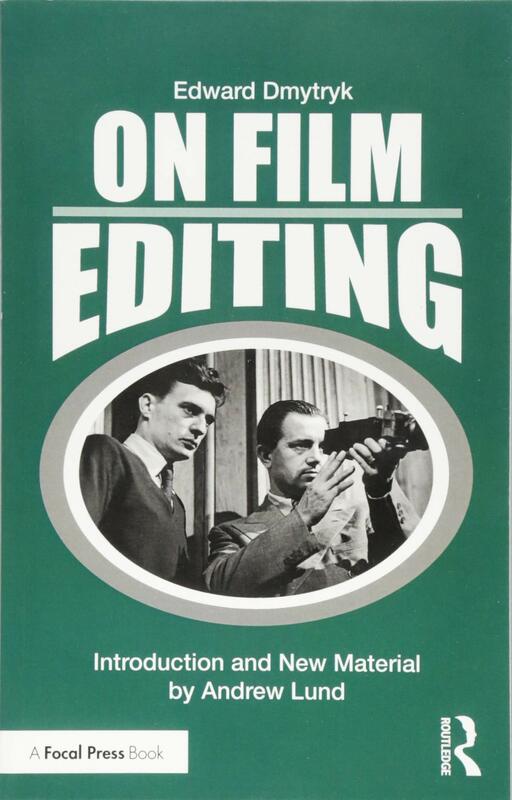 ON FILM EDITING: This book is a real classic. Technically, though, is dated, that is true. It’s a book written at the beginning of the ’80s, so no computers then. Most of you are all familiar with Avid, Final Cut and Premiere Pro wonders, the tech avantgarde of these days’ editing. It’s amazing how everything has changed since this book was written. At the same time, it’s amazing how little things have changed. Not trying to get you confused. It’s just that reading Dmytryk’s lessons on film, moviolas and A & B rolls sounds Jurassic. But his lessons on editing as storytelling are still alive and kicking as brand new. Edward Dmytryk was a superb filmmaker -first as an editor, then as a director in his own right – check The Caine Mutiny and learn. In the ’40s, the House of Un-American Activities Committee (HUAC) investigated Communist Party influence in the film industry, and Dmytryk was among those called to testify about it before HUAC in 1947. Dmytryk had briefly been a Communist Party member in 1944 and 1945. He was persuaded by his former Party associates to join nine other Hollywood figures in a public refusal to testify. The “Hollywood Ten” were cited for contempt of Congress and sentenced to prison terms. Dmytryk was fired from RKO (Wikipedia). It was the early 1930s. A very important guest, Baron Rothschild, was being given Paramount’s version of the Grand Tour. One of his stops was my cutting room, where I was asked to say a few words by way of defining my craft. I was young and enthusiastic. Some twenty minutes later, as I paused for breath, the Baron smiled. I agreed, trying to ignore the twinkle in his eyes. Of course, I was then a film editor. A few years later, when I became a director, I would have probably changed my pitch-but not too much. It’s a book all about editing, but, by being about the editors’ world, is about writing, directing and acting too. John Wayne was wont to say, “I don’t act, I react.” It was by no means an original phrase, and if it was meant as a self- assessment of his ability, he was shortchanging himself. At best, screen acting is a difficult art, whose subtleties often escape its critics; it demands great competence in all its aspects, of which, as the cliché indicated, reacting is one of the most important. In the theatre, dialogue may be “king”—in films, the reaction is where most things happen. A reaction is a transition, change, movement —and movement is life. A reaction can reveal the birth and growth of awareness, show a quantum leap in levels of anger or of love, or discover to us the gathering of one’s wits in thought or a change in attitudes or state of mind. It can express approval, doubt, or disbelief and do so in a universal language—without words. In the book, Dmytryk lays down a series of rules, which still stand as milestones for new editors. 1- A film’s first viewing should evoke an emotional reaction, not a critical one. 2- A film should be cut primarily for the picture. (With the exception of certain musical sequences). The images change, interrelate, grow, diminish; the soundtrack is an accompaniment. The listener’s hearing is continuous, his viewing is not. 3- All properly made cuts are unnoticeable. The finer the editor’s technique, the less noticeable her decisions because most cuts are specifically done to pass unnoticed. Smooth cutting depends on the director neither cutting “in camera” nor shooting long master shots with little or no coverage. 4- Never make a cut without a positive reason. Stay with a shot as long as that shot is the one which best delivers the required information. Cut to another shot only when the new cut will better serve the purposes of the scene, whether because the size is more effective, the composition is more suitable, or the interpretation is superior. Then find the exact frame to leave one scene and the exact frame to enter the next. Cutting to a close up when no enhancement of emotion is called for is not only wasteful but will diminish the value of subsequent close-ups. The only reason to use another shot is to improve the scene. 5- Cut on action whenever possible. Excluding cuts made at the beginnings or endings of sequences and cuts involving exchanges of dialogue, the editor should look for some movement of the actor who holds the viewer’s attention and use that movement to trigger the cut from one scene to the next in order to make the cut invisible. Principle: create “diversion”. Actor exits a scene frame left/cut at the point where the actor’s eyes leave the frame. Cut to the second scene should be made from 3 to 5 frames ahead of the point at which actor’s eyes reenter the frame at the opposite side of the screen. Viewer’s eyes cannot focus while moving, and moving takes 1/5 of a second. If the cut takes place within that time, it will be unnoticed. Loud sounds also cause the audience to blink. Make sure the cadence or rhythm of the actor’s delivery and movements are honoured. The rhythm of the movement must be maintained even if the cut has to be shortened or lengthened by a few frames. Proper rhythm is less disturbing than a slightly imperfect cut. 6- Scenes should begin/end with continuing action. = cut into and away from a scene while it is still “alive”. A common cut is the “look off”. The viewer will not accept the fact of a look until he sees the actor’s eyes focus on something off-screen. At that point, the audience, too, will look off, following the actor’s gaze. By the time his own eyes have refocussed, the actor’s POV shot should occupy the screen. To make the cut, then, we fix the frame in which the actor’s eyes have frozen, add 3 or 4 frames more to give the viewer time to react, and then cut to the POV. The POV shot should last just long enough to deliver its message. This depends on how easily “read” the shot is. Insert shots of text requires special judgement—but favour the slow reader. If it is a repetition of an earlier shot, it can be shorter than if it is new. Note: when more than one actor occupies the screen and they look offscreen, the editor must decide which actor the audience will be looking at, and then time the scene for the re-focusing of that actor’s eyes. 7- “Fresh” footage is preferable to “stale”. If you must include extra footage, always choose to place extra footage at the beginning of the incoming cut. Cut for proper values rather than proper matches. A) Ignore the mismatch. If a cut from wide shot to CU should be made for dramatic value, the audience will ignore the mismatch. The important thing is to know where the viewer will be looking. Dramatic requirements must always take precedence over the mere aesthetics of editing. B). Cut to a closeup will often omit undesirable movement, etc. Or take the lousy shot and blow it up during the online. C). If all fails, precede the desired cut to B by replacing the end of A with a CU. “Delivery” and “reaction”. Exactly where, in each cut, does the editor leave the scene and exactly where does she start the incoming cut? Proper timing of each is of the greatest importance. 9- The editor must understand the grammatical structure of the English language: the subject is near the start of a sentence and is followed immediately by the predicate. Rest of the sentence consists of enlargements or modifiers. This means that the sense of any statement is manifest before that statement is completed (this is the reason for our ability to interrupt). The listener will often respond with a grimace or reaction well before the end of the speaker’s statement—and so will the viewer. 10- A reaction can reveal the birth and growth of awareness without words. The editor must always look for where she can edit on reaction rather than words. Find the first frame of the reaction and add 3-4 frames. Includes the possibility of briefly freeze-framing the beginning of a “frozen” reaction shot prior to movement. All such scenes are highly choreographed by the director because all “real” action scenes include much “dead” time. Editor’s job is to line up the takes in proper sequence and then cut together using the ‘action-match” technique. Audience cutaways are not wise moves, generally, because the viewer does not want to be told what his reaction should be by being shown a model of it. Withhold your judgement of such scenes until sound effects are laid in. Musical score serves to increase the apparent pace of most sequences. Therefore, the editor will probably want to decrease the pace of the scene. Usually, feature exit-entrance cuts and alternating shots of pursuer/pursued. When two or more shots of one are needed, use a shot of a passing car to move into a close up of the interior of that car. The windshield will double as the protagonist’s face. The mood is most important. The viewer must catch the mood. Never let go of the mood. A shot must never be left on so long that the audience can analyze it, and it should never be repeated. Many types of audiences, but each type of audience acts as a monolith. Each type will provide a certain kind of “laugh”, for instance. Film previews are crucial. 16- Last but not least, the rule that forms the epilogue of the book, maybe the most important rule of them all: Substance, then form. Norman Cousins, in one of his perceptive editorials, wrote, “We are turning out young men and women who are superbly trained but poorly educated. They are a how-to generation, less concerned with the nature of things than with the working of things. They are beautifully skilled but intellectually underdeveloped. They know everything that is to be known about the functional requirements of their trade but very little about the human situation that serves as the context for their work.” * (italics added). Six years of teaching have made me acutely aware of the truth of Mr Cousins’ words. They have also convinced me that the condition he describes derives not only from the students’ desires but also from the teachers’ aims. Which leads me, at the risk of being charged with redundancy, to offer a few final words of advice: This book has persistently stressed technique and has urged the pursuit of perfection in its use. But the “human situation,” in all its guises, is what good films are all about, and technical skill counts for nothing if it is used only to manufacture films which have little to do with humanity. This entry was posted in BOOKS on filmmaking, FILMMAKING and tagged editing, edward dmytryk, On Film Editing. Bookmark the permalink.